Streaming music is the in thing nowadays, especially that some services have the free subscription give outs. Spotify had almost everyone locked in when it was first introduced. The reason being for its popularity and the free offer gig that was, however, subject to ads. It was not long before this dominant streaming service got potential challengers. Apple Music vs Tidal is the in-talk at present. They are the two largest players that are currently trending in the music streaming market. Since its launch way back in 2015, Apple Music has continued to grow in popularity probably due to its massive catalogue and manageable low price. Tidal, on the other hand, is dedicated to sound quality and far much better file compression and a tendency to feature big names like Jay Z and Madonna. It’s better to have a holistic look at these two streaming services. You would agree with me that a service is all about the music quantity. Apple Music users have the audacity to access and enjoy close to 45 million tracks while Tidal trends at 40 million tracks. In fact, some artists exclusively release their music videos to Apple Music before any other streaming services get hold of them, e.g Snoop Dogg’s ‘Coolaid’, Vic Mensa’s ‘We Could Be Free’ and other Apple Music exclusives. The Apple Music streaming services playlist curation is based on the users’ interests and the music that is played regularly while Tidal’s playlist curation is based on genres and the latest songs in each category. Tidal also is a home to original shows which turns the well-known songs into films and video, e.g Irv Gotti’s ‘Tales’. Looking at which is better Apple Music or Tidal in terms of music discovery? Apple Music could be at a higher level in that it has more discoveries for your take. With this, you can simply sync your devices across. In fact, iTunes can synchronize all the acquired information, settings as well as download the purchases you’ve made on other services. Besides, you better discover the ‘Beat 1’ feature which is a radio channel with a unique take on music and other entertainments. Others include ‘New Music Mix’ which is actually updated every other Friday with new personalized songs. Tidal music streaming service has the ‘curate playlists’ which is quite a unique feature. Here, you’ll find playlists and recommended albums that are constructed by its employees. Other than these, enjoy Tidal’s behind the scenes footage and Full HD videos that make your music experience a real fun-filled one. On this, Tidal has an audio quality of about 1,411 kbps bit rate with formatted lossless files. This is pretty a high rate which cannot be compared to Apple Music’s 256 kbps audio quality. Basing on Tidal HiFi vs Apple Music, Tidal has one of its membership tiers as ‘HiFi’ subscription. This, actually, steams more than its standard AAC 320 kbps rate. You can also stream at CD-quality lossless compression, which is higher as compared to its other level. Tidal has a compensation plan for a 50% discount for students. It actually offers two membership tiers. There is a basic plan that goes for $9.99 monthly rate. There is also the ‘Hi-Fi’ premium subscription at a rate of $19.99. This actually includes everything that the standard subscription has in addition to the lossless compression that it streams at. Apple Music, on the other hand, has three subscription plans going for $9.99 per month for individuals, $14.99 per month for a family subscription for up to six people as well as $4.99 per month with Apple Music student discount. Many users have rated the rate at which this plan streams as low, in comparison to other streaming services. When it comes to artist’s compensation on Tidal vs Apple Music, Tidal has a huge whip on this. It pays $0.007 per stream, a rate much higher than Apple Music’s $0.0013 per stream. So, if you care about the musicians behind your favorite music, know that Tidal is in solidarity with you. However, note that the popularity of the song will also play a major role in regard to this. Apple Music’s user interface is wanting. Besides being sharp with easy navigation moves, it has more features. The inclusion of playback controls found at the top left and search at the top–right are good signs of an engaging interface. You can also make use of the MiniPlayer by setting it to display on top of other windows as it takes less space. For Tidal, the user interface is quite bulky and glitch. Its entire lifecycle is crumpled by technical errors from time to time. Apart from songs auto-skipping, the app has a crashing habit. This will, however, be corrected with time. Even though Apple Music seems to get all that it takes to easily navigate through the user interface, all hope is not lost for Tidal. The latter can handle offline playback with more ease as compared to Apple Music. Tidal’s sound quality has no boundaries and is rest assured that it will be extended to your mobile device whenever you decide to listen to your favorite tracks offline. In this Apple Music vs Tidal arena, it seems that Apple Music does not have a proper mechanism for offline play, for example clicking on ‘My Music’ will populate even the lists that are not available offline, making it difficult to do a quick track selection. You don’t necessarily expect the ride of Tidal vs Apple Music to be a walk in the talk. There is a real battle such that the decision lies with the user. However, some distinctive features can help clear the tides. Apple Music has lucrative deals to the user while Tidal offers more pros to the artists. It pays them good compensation and the sound quality is up to par. If perhaps you need more than the normal music streaming, then Apple Music will do you good. Artists keep updated posts of their new music and ideas so it is easy to connect with them directly on the site. Furthermore, its attractive and user-friendly user interface makes Apple Music streaming service your pick. While, if you decide to choose Apple Music, one thing you should keep in mind is that although it enables the possibility to synchronize data with any Apple authorized device but you won’t be able to play them on other non-Apple supported music players and devices, such as MP3 player. 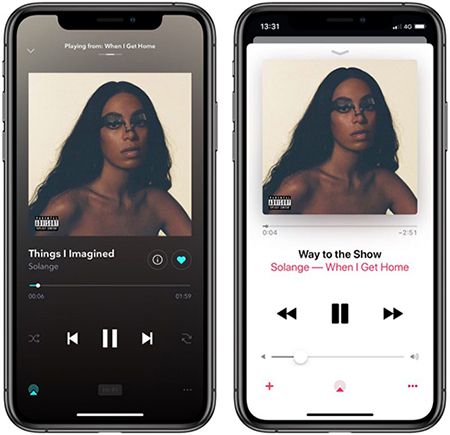 Certainly, you can use a third-party tool, like AudFree Apple Music Converter to convert Apple Music to common audio files, like MP3 and then listen to them on all devices with ease.